If you own a condominium in our community that you wish to sell/rent, you may contact MAY Management to have your unit listed. All listings will be entered using the current date as the start date. The 'end date' will be 120 days from the current date you are listing your property. If you have not sold or rented your property in that time you need to let MAY know so we can update your listing for another 120 days. NOTE: For any rental unit we must have the Flagler County LBTR# in order to list your ad. If you have sold your unit or are under contract, please let us know so we can remove your listing. Failure to follow these guidelines could result in your listing being removed. 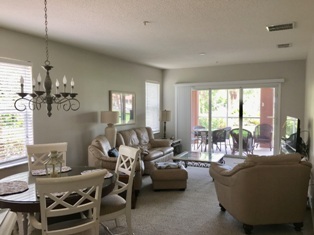 This first floor 2-bedroom, 2 bath condominium is a perfect home, with lake views and extra space to pull up a chair and enjoy the sunsets from either the screened-in lanai or the patio outside. There is new, plush carpeting throughout. A brand new water heater was put in in September. The air conditioner is only 4 1/2 years old. There is a one-car detached garage. Canopy Walk has miles of walking trails,a dock with a covered pier for all to enjoy, a swimming pool and spa, gym and clubhouse. If you desire a friendly, well-maintained and relaxing neighborhood, Canopy Walk is for you. Please call to arrange a viewing of this beautiful condominium and start living your dream. Showing Instructions: Call Sonny at 407-492-9924. Intracoastal unit, 3BR, 2BA, ground floor, end unit with great views of the intra coastal and lots of natural lighting! Centrally located on property and largest floor plan offered in Canopy Walk. Professionally painted and well maintained. Some furnishings negotiable. Ready for immediate sale. Great seasonal tenants for future rentals if interested. Rentals considered; contact me for more information. Showing Instructions: FSBO - Call Julia. More pictures available and glad to answer any questions you may have! Intra-coastal 2 bedroom, 2 bath condo on the third floor. Great views from lanai of the river and marina. Currently have rental with 2 year lease. Great investment opportunity. Also have boat slip for sale if interested. 3 bedrooms, 2 Baths, 1,712 Sq Ft.
Our peaceful Intracoastal Waterfront 1st floor end unit has all the comforts of home with a great view of the Intracoastal. Spacious Master Suite with King Bedding plus 2 additional bedrooms with Queens; 2 full Baths - walk in shower, bathtub; Eat-in kitchen with dishwasher, refrigerator, stove, microwave, toaster, keurig and more; Dining area; Living Room; cable TV, private Internet in unit with Wifi, Central Air Conditioning throughout; Laundry room just off Foyer with Washer & Dryer; Large Screened patio plus extra outside patio; BBQ area just steps outside our building. Add $75. Cleaning fee per visit; Add 12% tourist tax for stays < 6 mos. - Inquire about our US Military discounts! 3 bedrooms, 2 Baths, 1,377 Sq Ft. Enjoy the view of the Intracoastal and beautiful Canopy Walk grounds and pool. It's conveniently located just minutes from the beach, restaurants & shopping. Also easy walk to European Village. St. Augustine & Dayton Beach approximately 30 minutes drive. Beautifully updated condo, all new furniture. Highly desired 1st floor condo! 1 King Bed, 2 Queen Beds, well equipped kitchen with all linens furnished. Laundry in unit. Wifi and upgraded cable included. 1 month minimum. Strictly no smoking, pets, 6 person maximum. $250.00 refundable security deposit. $100.00 cleaning fee.